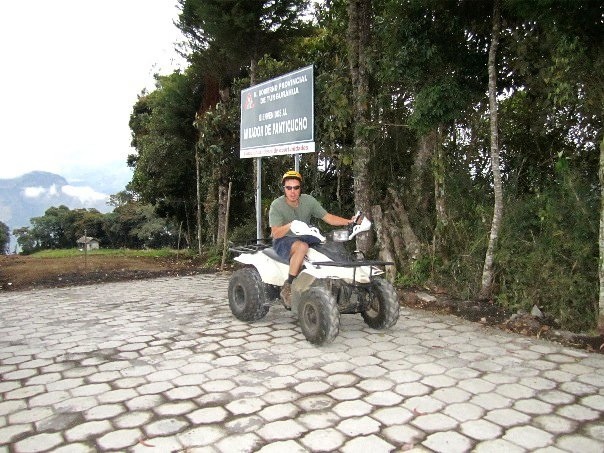 Last weekend MPI Ecuador took its second retreat of the year to Baños. It was a first trip for all of us (except Bibi), and we loved it. Situated on the western side of the Sierras in the zone where mountains transition into Amazonian jungle, Baños is warm and beautiful and full of fun things to do. We arrived on Sunday morning, dropped off our things at the hostel, ate a delicious lunch, and immediately set out to cross activities off of our list. As with many tourist towns in Ecuador, the streets of Baños are lined with tourism agencies from which you can rent equipment and guides to take advantage of local adventure opportunities. 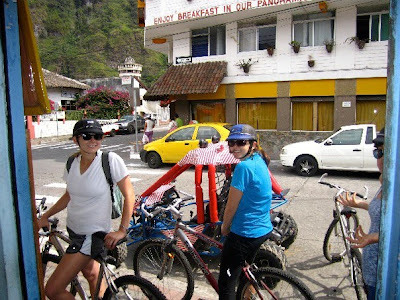 We rented bicycles for one of the local trails and set off for the hills and waterfalls surrounding the small town. First, however, we stopped at the San Francisco bridge to check out something we’d been talking about for weeks in anticipation: puenting. 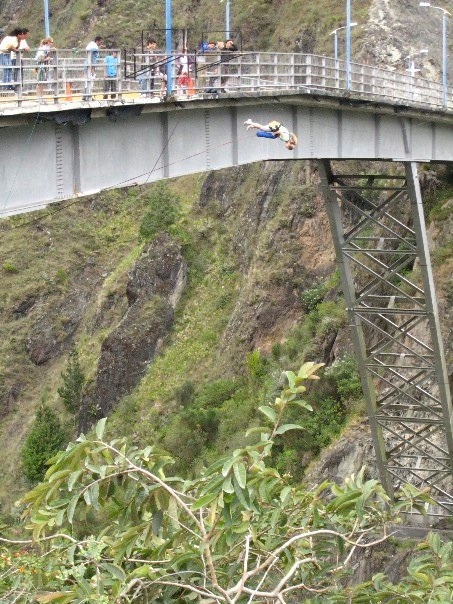 “Puenting” is a shamelessly Spanglish term (puente means bridge, so it was “bridge-ing”...?) referring to the activity of jumping off of a bridge attached to a rope and swinging underneath. We pedaled up to the bridge to find a line of folks watching as a girl stood on the platform psyching herself up to jump. She tried for 15 or 20 minutes, but eventually she stepped down, unable to bring herself to actually go over the edge. I don’t blame her; I wasn’t able to do it either. But everyone else in our group did! Hannah puenting off of Puente San Francisco! The bike ride continued to be beautiful and was followed by dinner and a nighttime chivas bus ride (the same kind of bus that hosted Chet’s birthday on the streets of Quito back in July) up to the lip of Tungurahua volcano overlooking the town. Before we returned home the following afternoon, PDs split off for multiple activities in our remaining hours. I for one, as the house’s early riser, went at 6:30am to take advantage of the thermal baths that Baños is known for, its full name being Baños de Agua Santa, or “baths of sacred water,” the town having developed around the site of an appearance of the Virgin Mary near a waterfall. It was spectacular to sit in steaming waters underneath a cliff of greenery and right next to an enormous waterfall in the first hours of the daylight. Other PDs throughout the morning and early afternoon also went to the baths, rented go-carts, got massages, and explored the small, lovely town before catching the bus back up the Pan-American highway to Sangolquí. Overall the retreat turned out to be the perfect mix of adventure and relaxation, and we all came back refreshed and ready for the week. 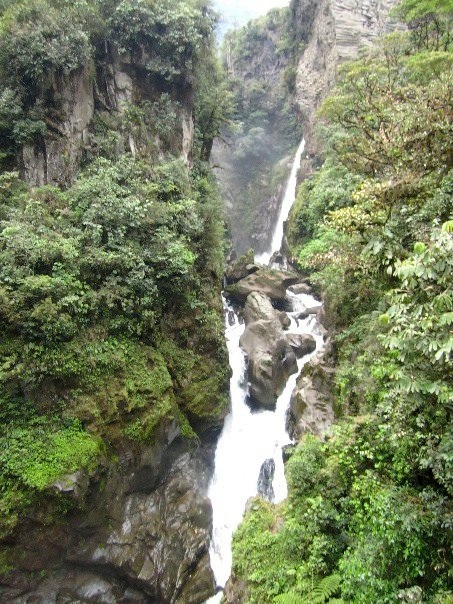 I personally loved Baños and am really excited that I get to go back in just a few days with one of our first spring break volunteer groups, from Duke, for Carnaval. Brock on his rented ATV. 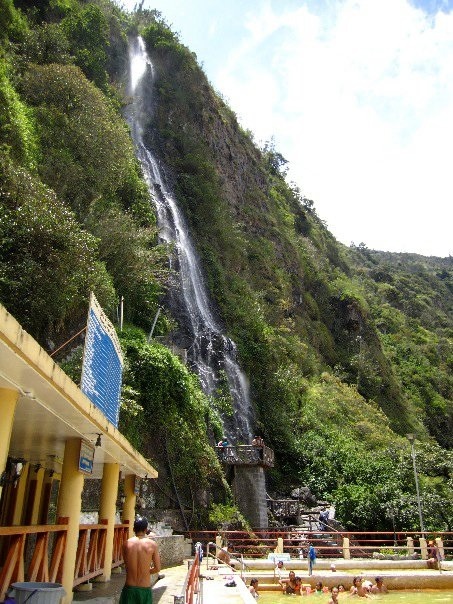 One of the many cascadas surrounding Baños. The cascada overlooking the thermal baths. Keep a lookout for posts from spring break groups over the next two weeks! We’re extremely excited to be hosting four fantastic groups of volunteers from Duke, Vanderbilt, the University of Georgia, and the University of North Carolina-Wilmington. Duke and Vanderbilt arrive this coming Sunday, and we can’t wait! I've never seen Pailón del Diablo with so little water. Are you guys in a drought?